Keep in mind that I have retired from scrapbooking, so the only legacy for my pictures is here on the old blog. If you don't want to see a bunch of pictures, you should come back in a few days. So get ready, I'm going to post these as fast as I can get them typed and editted and whatnot. When people ask me how the Caymans were, the highlight (for everyone) was Stingray City. Christina also loves Stingray City, but ended up getting a job and couldn't make it out with us. 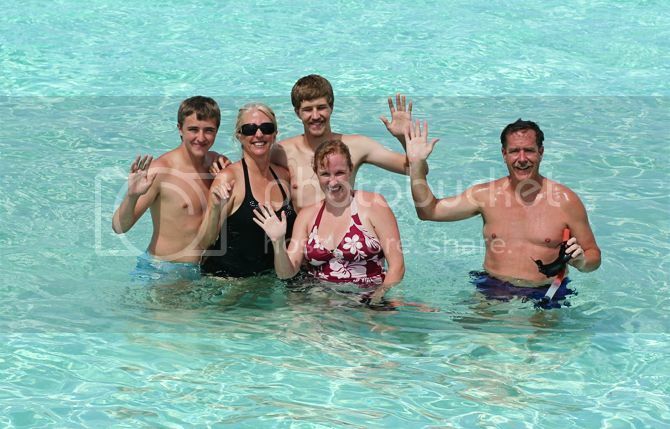 Too bad for her, because look at my fam in the lovely, clear water. We took a boat out into the middle of the bay (or harbor??) where there were several boats gathered. The stingrays flock to the boats because the boats bring them delicious calamari to eat. Here is our crew: Laura, Rachel, Finley, Sol, Ben and Dan. If you know me from when the boys were little, these pictures may make you feel very old because my brothers are very big. The rays were kind of scary at first--they would fly beside your legs and brush up against you. They felt like a wet portobello mushroom. But if you stood in their path you could catch one. Sol was really proud that he corralled one, and Laura wanted to pretend like she was the one who caught it. I likened the stingrays to puppies; they swam right up to you and wanted calamari. They would kiss the dudes who were handing it out! It was so fun after we got used to it--while Finley never actually noticed the rays, it apparently wore him out. 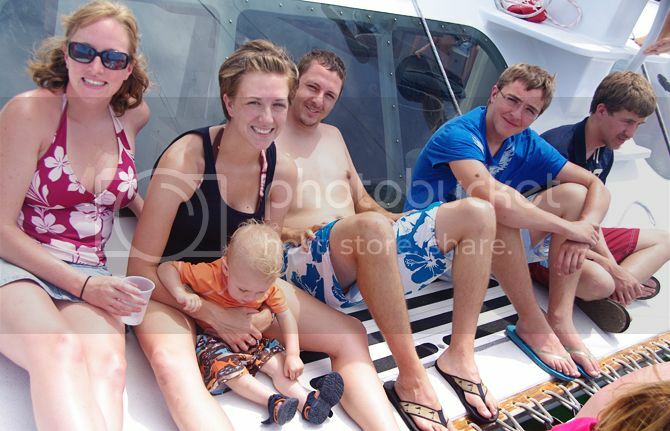 Which led to the actual best part of Stingray City, holding my sleeping boy. Stingray City gets 1 million out of 5 stars. It was a blast. One time I held Finn and he fell asleep. Not as cool as stingrays, but still really really awesome. Um, that picture of Finley asleep, with his lips puckered like that, is the cutest thing ever. You should frame it. It makes me want to hold my sleeping baby right now!